I've come to expect great things out of Maggie's work, so I'm not surprised by how much this story swept me away, but there's still a sort of stunned pleasure when her words manage to cause both happy and sad tear at the same time. Scorpio Races did just that. I hate to compare this book to any movie because it's nothing like them, but when I think of the way the connection between Sean and Corr or even Puck and Dove made me feel (this strong sort of love and devotion unlike that between humans) I'm reminded of the connections between others horses and riders like those in War Horse or Wild Horses Can't Be Broken, both stories that moved me to tears as well. Maggie was able to take a horse that should be feared and give it heart, make it worth loving. While the book switches between Sean and Puck's POV, at times I felt like even the horses had a voice, too. I loved both Sean and Puck's characters completely, but there were also side characters that really left an impression with me like: Puck's brother Finn, who at times is completely scatterbrained but also perfectly sensible, and Mr. Holly who seemed to have something to gain but wasn't dirty in the way he tried to obtain it. In fact, he seemed to be sort of a voice of reason, that outside perspective Sean and Puck needed at exactly the right times. There's a love story in this intense tale, too, but it's hardly essential. It's lovely in it's own way: the slow nature of it, the way it's unforced. I loved that it wasn't gooey or the primary focus, it just sort of happens, like it was meant to. But I also think, that if it hadn't happened at all, this story would have been fine without it. A story of two sort-of-strangers who become great friends because of their common need. I feel like if I say much more I'll be heading into spoiler-land and I absolutely don't want to ruin this for you. Just do yourself a favor, make some November Cakes and get lost in The Scorpio Races. I hope it leaves you in happy/sad tears too. 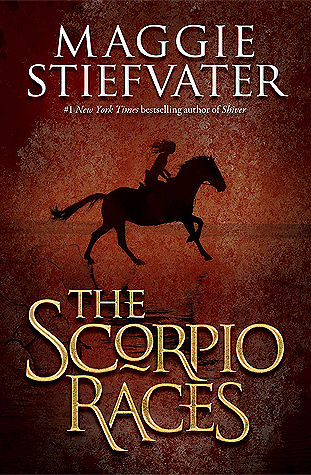 Sign into Goodreads to see if any of your friends have read The Scorpio Races.